Using ovarian surface epithelial cells from mice, researchers from Virginia Tech have released findings from a study that they believe will help in cancer risk assessment, cancer diagnosis, and treatment efficiency in a technical journal: Nanomedicine. Their studies showed a mouse's ovarian cells are stiffer and more viscous when they are benign. Increases in cell deformation "directly correlates with the progression from a non-tumor benign cell to a malignant one that can produce tumors and metastases in mice," said Masoud Agah, director of Virginia Tech's Microelectromechanical Systems (MEMS) Laboratory and the lead investigator on the study. Their findings are consistent with a University of California at Los Angeles study that reported lung, breast, and pancreatic metastatic cells are 70 percent softer than benign cells. The findings also support Agah group's previous reports on elastic properties of breast cell lines. Agah worked with Eva Schmelz of Virginia Tech's Department of Human Nutrition, Foods, and Exercise, Chris Roberts of the Virginia-Maryland Regional College of Veterinary Medicine, and Alperen N. Ketene, a graduate student in mechanical engineering, on this work supported by the National Science Foundation and Virginia Tech's Institute for Critical Technology and Applied Science. They are among a number of researchers attempting to decipher the association of molecular and mechanical events that lead to cancer and its progression. As they are successful, physicians will be able to make better diagnostic and treatment decisions based not only on an individual's genetic fingerprint but also a biomechanical signature. 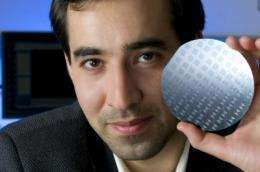 A turning point to the research has come with recent advances in nanotechnology, combined with engineering and medicine. Agah and his colleagues now have the critical ability to study the elastic or stretching ability of cells as well as their ability to stick to other cells. These studies on the biomechanics of the cell, linked to a cell's structure "are crucial for the development of disease-treating drugs and detection methods," Agah said. "We have characterized the cells according to their phenotype into early-benign, intermediate, and late-aggressive stages of cancer that corresponded with their biomechanical properties," Agah reported. "The mouse ovarian cancer model represents a valid and novel alternative to studying human cell lines and provides important information on the progressive stages of the ovarian cancer," Schmelz and Roberts commented. "Cell viscosity is an important characteristic of a material because all materials exhibit some form of time-dependent strain," Agah said. This trait is an "imperative" part of any analysis of biological cells. "When cells undergo changes in their viscoelastic properties, they are increasingly able to deform, squeeze, and migrate through size-limiting pores of tissue or vasculature onto other parts of the body," Agah said.